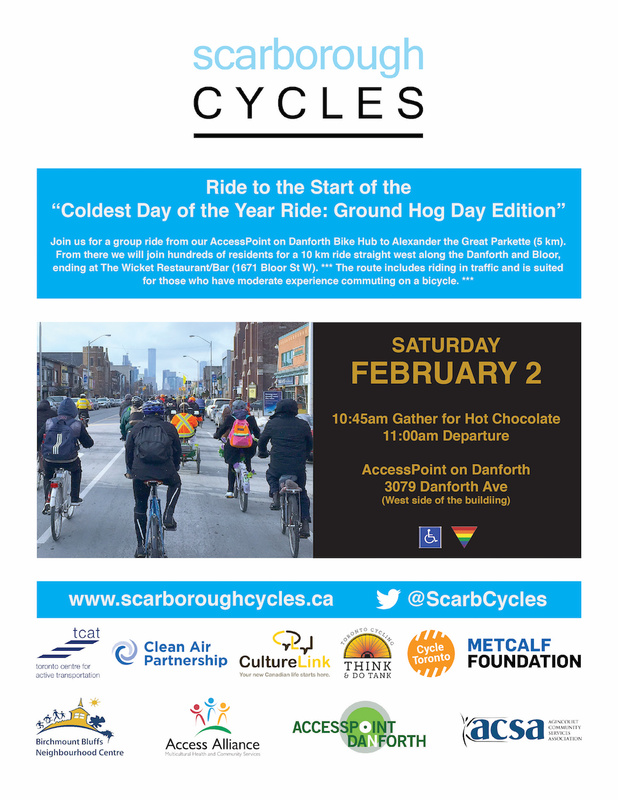 Join Scarborough Cycles for a group ride from our AccessPoint on Danforth Bike Hub to Alexander the Great Parkette (Logan Ave and Danforth Ave), where we will join hundreds of other residents! Please Note: The route includes riding in traffic and is suited for those who have moderate experience commuting on a bicycle. Join Cycle Toronto for our annual Coldest Day of the Year Ride on Saturday, February 2! This year, we’re calling it the Groundhog Day Edition. You’ll remember that we started last year’s ride on the Danforth – a bustling main street with more than enough space for protected bike lanes – and impressive bike counts (over 3,000 on a summer weekday as documented by our Ward 14 Bikes group (formerly Ward 30 Bikes). This number is comparable to the pre-bike lane volume on Bloor St. W.
Considering so little has happened to make Danforth bike lanes a reality over the past year, we’re heading back there to ask: what’s the holdup? Danforth can have it all: protected bike lanes, on street parking with little impact on motor vehicle traffic capacity. It’s endlessly frustrating that all we seem to be able to achieve is more and more studies of the obvious: we need safe streets now. Join us to ride on the Coldest Day of the Year and let’s make sure our elected officials know we’re already riding, and it’s time for the infrastructure to catch up. This relaxed, family-friendly ride will be about an hour, followed by a social where you can warm up, chat with other riders, and enjoy some food and drink. It’s a great chance to meet fellow riders and give winter biking a try. We’ll meet at Alexander the Great Parkette at Danforth & Logan at 11:30AM. We’ll ride straight west along the Danforth and Bloor, ending at The Wicket, located at 1671 Bloor St W (near Dundas St. W.). Take advantage of our ride special! We’ll be offering our ride special: $40 for a membership and a pair of Cycle Toronto socks. Don’t have a bike? No problem – a limited number of Bike Share Toronto bikes will be available! To reserve a bike, email info@cycleto.ca with subject line: Coldest Day Bike Share reservation by end of day Thurs Jan 31. Start and end points will be accessible by TTC. Get ready to ride with Keagan’s winter biking tips. Review the rules of the road with our Toronto Cyclists Handbook. Check out why our members ride with our #BikeWinterview series.